Now days we hear lot about cloud and like to explore more on it. Recently Oracle launched cloud services that we can use to create service instances. This post is specific to Database Cloud service. 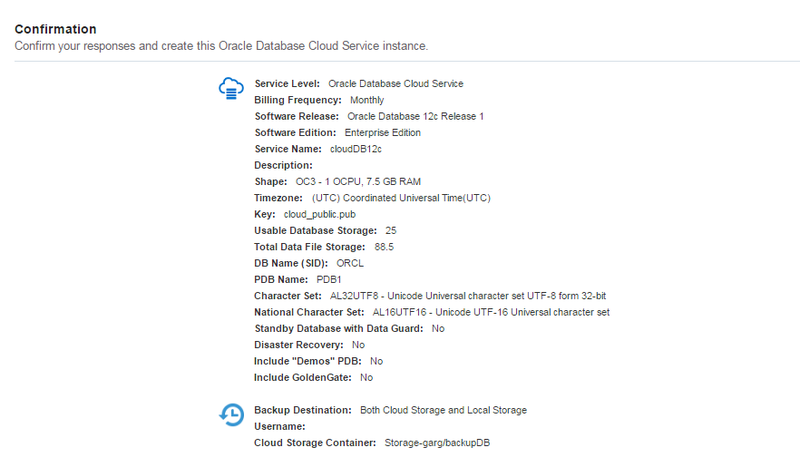 DBaaS (Database as a Service) is a service instance in Oracle Database Cloud. On premises setup we use to install Oracle database server on local hardware but in cloud, no need to have a setup, just need to confirm some parameters and we are good to use it. 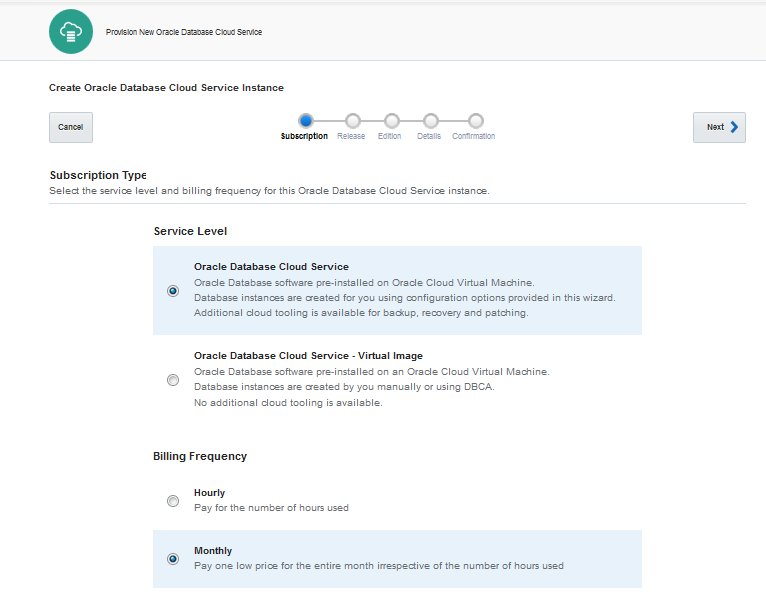 In this post, we will show how you can create service instance of Oracle Database Cloud. Follow below steps for the same. Step 1: Go to https://myservices.emea.oraclecloud.com/mycloud/faces/dashboard.jspx. 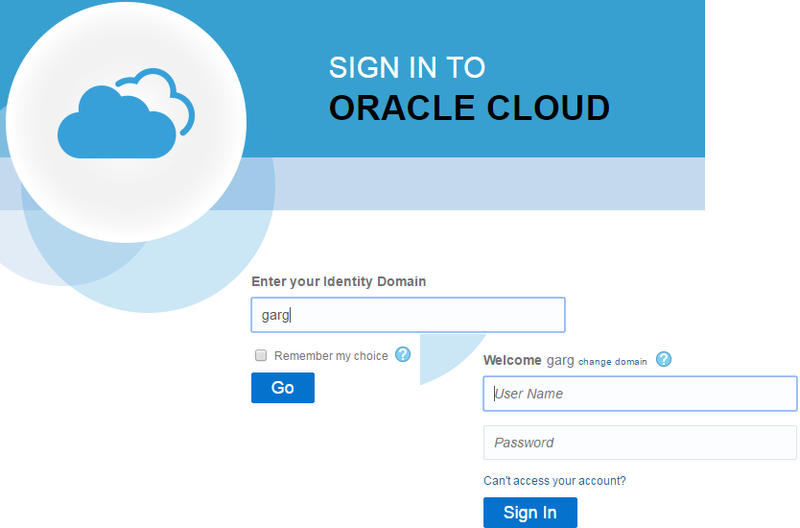 Login with your credentials that you have received from Oracle when you register for trial version. Click on “Service Console” option as shown in below screen shot in “Oracle Database Cloud Service” section. Click on “Go to Console” to go to service console. Click on “Create Service” button to initiate the process of service creation. Step 2: Subscription: Here you need to choose subscription type that cover Service Level and billing frequency. You can keep the default values for now. Step 3: Release: Here you need to choose Database release version, keep the default option (Oracle Database 12c release 1). 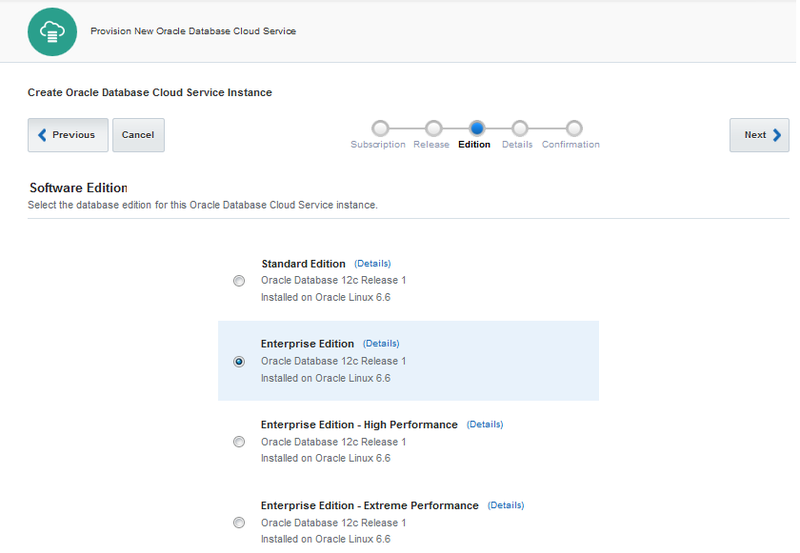 Step 4: Edition: Here you need to choose the database edition, again keep the default one selected (Enterprise Edition). Step 5: Details: Here you need to set some parameters to get the service ready for use. First of all go to “Service Configuration” section and set below parameters. Time Zone: Select the time zone. 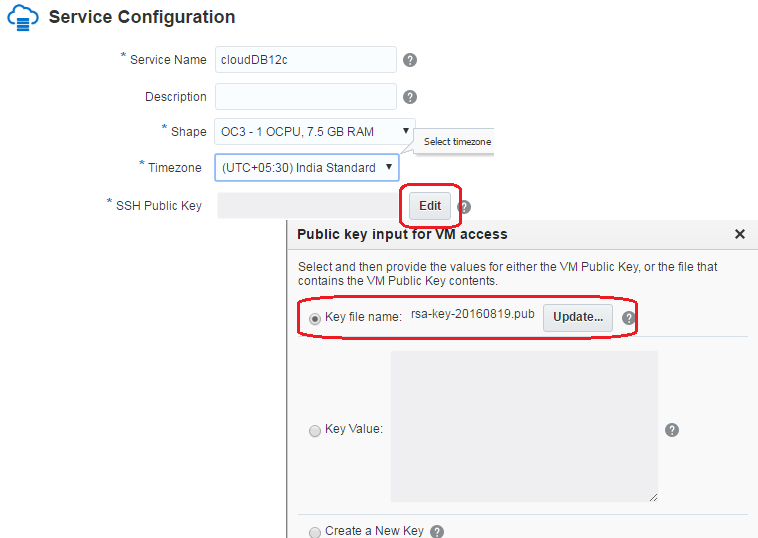 SSH Public Key: Browse the public key file that you have created in last. In case you don’t have that file, you can refer this post to generate SSH public key. Then go to “Backup and Recovery Configuration”. In this section, you need to choose the backup option. 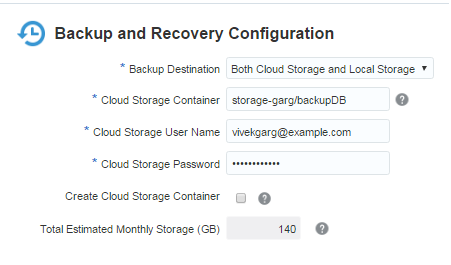 Refer Oracle Storage Cloud Service post if you haven't created Oracle Storage Cloud service already. Backup Description: Choose Both Cloud Storage and Local Storage option. Cloud Storage Container: Enter the details as per below syntax. For this post, it will be storage-garg/backupDB. Cloud Storage User Name: Username configured while creating cloud storage container. Cloud Storage Password: Password configured while creating cloud storage container. Then move to “Database Configuration” section, where you need to provide the password for SYS & SYSTEM accounts. Step 6: Confirmation: Here you need to review the summary and click on create to create the service. Step 7: Once you create database cloud service, below window show the status of that service. Status shows as “In Progress” and it takes around 30 to 60 minutes to setup this service so you need to wait for that much time to use it.